This looks like a redesign of the one they had at this time last year. I got 3 last year and they are pretty good. They take 3AAA batteries and are quite similar to the LED Lenser T7 but that takes 4AAA (I have both). Anyway I will be buying this to see how it compares to last year's model. It looks a bit slicker in the photo. They look good..... and you wont have to risk Dealextreme. Will these kind of torches work well (or at all) with rechargeable batteries? Does a difference of 0.9v make a difference to the way these torches work? Apologies if this is a stupid question but no-one seems to mention this. Will these kind of torches work well (or at all) with rechargeable … Will these kind of torches work well (or at all) with rechargeable batteries?Rechargeable batteries are 1.2v not 1.5v, so1.2v x 3 = 3.6v1.5v x 3 = 4.5vDoes a difference of 0.9v make a difference to the way these torches work?Apologies if this is a stupid question but no-one seems to mention this. Yeah they work fine.... I have a couple of Cree torches and always use rechargeables. Preferably the LSD type. I have bought several Lidl Cree torches in the past. They have all been terrific. One tip when you buy a torch like this is to oil the threads and the focus mechanism. Makes it work much smoother. I've never had any issue with ordering from DX. I take it you have? One tip when you buy a torch like this is to oil the threads and the … One tip when you buy a torch like this is to oil the threads and the focus mechanism. Makes it work much smoother. Good tip, but be sure to use silicone based lubricant. Oil based lubricant can prematurely perish the o-rings. Nope.... never had an issue with DX. But if a problem were to appear, its not really viable to send a torch back is it. One of mine last year was DOA but I was able to take it back and exchange it for a replacement easily. One of mine last year was DOA but I was able to take it back and exchange … One of mine last year was DOA but I was able to take it back and exchange it for a replacement easily. Exactly..... you couldn't do that with DX..... thats the risk with buying from them. Exactly..... you couldn't do that with DX..... thats the risk with buying … Exactly..... you couldn't do that with DX..... thats the risk with buying from them. I bought some torches from DX last year (admittedly only cheapo kids 70p pig ones) and they took a full month to get to me. Within a day all 3 had stopped functioning. Personally it put me off, but obviously a lot of people use them and have no problems. I have one of these, very good quality and bright. What wattage are these. One watt or three watts? Can't vote without knowing. what Lumen are these rated at ? Good idea. I would suggest staying clear of WD40 though, may well cause damage in the long run to plastic or rubber parts, such as O rings. Save up 30 quid and get an led lenser p7 from a fleabay power seller. Will be the last torch you ever need to buy. Save up 30 quid and get an led lenser p7 from a fleabay power seller. … Save up 30 quid and get an led lenser p7 from a fleabay power seller. Will be the last torch you ever need to buy. I have the T7. 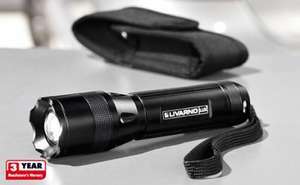 LED Lenser is a lot more expensive than this, this is a great deal, why would someone want to spend 4 times as much on a torch in the current economic climate? Anyone know how many lumens this is? I've used DX and VirtualVillage with no problems. Took me 10 days to get a 6v 20 rpm motor (£4.99+free delivery) from VirtualVillage that would have cost me 4 times that in the UK and delivery + the fact that you can't find them in the UK. I have bought a lot of stuff from China and if you don't receive anything after 30 days they refund you. I've used DX and VirtualVillage with no problems.Took me 10 days to get a … I've used DX and VirtualVillage with no problems.Took me 10 days to get a 6v 20 rpm motor (£4.99+free delivery) from VirtualVillage that would have cost me 4 times that in the UK and delivery + the fact that you can't find them in the UK.I have bought a lot of stuff from China and if you don't receive anything after 30 days they refund you. They never refunded me after a year just kept giving same response wait a bit longer i think a year is long enough. LOL it's a lot more lumens than that, I would say it's between 70 and 120. I suspect it will tell you on the packaging, so check on Thursday. Had one for about for a year now. Very pleased with light output. Brightest torch I have got - loads better than other alleged high power LED torches - it seems to have a lens and proper reflector. Batteries in the led lensers last 70 hours. I've got 3 CREE torches from DX all without a problem although they are all 900lm+, and I would do with a smaller one for stuff around the house. Lildl, expect us! nickman what Lumen is your head torch ? I'm after a decent head torch, but it has to be bright with a variable beam pattern. H7 pretty much Same but does not come with the easy recherge adapter no need to remove batteries etc. H7R 3 watt CREE LED chipOutput 140 LumensH7 pretty much Same but does not … H7R 3 watt CREE LED chipOutput 140 LumensH7 pretty much Same but does not come with the easy recherge adapter no need to remove batteries etc. AFAIK, there is no standard way of measuring the light output by lumen, so it's not really meaningful. More useful is the wattage consumed, though some of that is of course heat. nickman what Lumen is your head torch ? I'm after a decent head torch, … nickman what Lumen is your head torch ? I'm after a decent head torch, but it has to be bright with a variable beam pattern. Also has variable beam and even brightness adjusters both on sliders, it's a quality bit of kit. AFAIK, there is no standard way of measuring the light output by lumen, … AFAIK, there is no standard way of measuring the light output by lumen, so it's not really meaningful. More useful is the wattage consumed, though some of that is of course heat.